Train Derailment, Bridge Collapse Kills Two People Buried in their Car on Shermer Road, Glenview. Glenview and Northbrook firefighters and police officers responded about 1:40 p.m. Wednesday, July 4, 2012 to a report of a train derailment at the Shermer Road bridge just south of Willow Road. No injuries are reported. Apparently emergency responders are working on a witness report that no vehicle was buried in the rubble. An engineer and a conductor were on board the locomotive, which was safe on the tracks almost one mile southeast of the collapsed bridge and wrecked train cars — just east of the intersection of Glenlake Drive and Winchester in Glenview. About 20 coal cars had passed the bridge before the incident occurred. The pile of train cars was multi-level with piles of coal spilling onto the embankments, road, and shoulder below. The pile of debris could have covered more than a few vehicles passing underneath on Shermer Road. The stretch of railroad tracks does not carry passenger trains. So far, investigators don’t know if the train derailed and then the bridge collapse or if the bridge collapsed and then the train cars filled with coal piled into the gap. 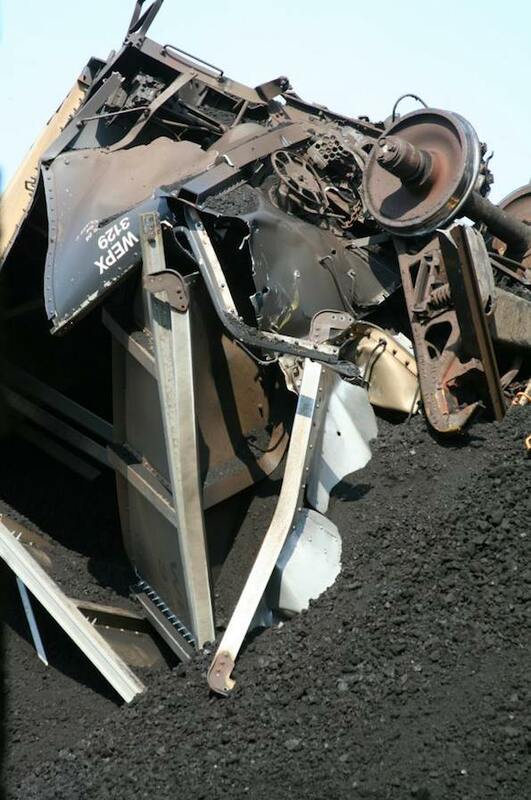 The pile up of about 17 coal cars filled with coal appeared larger than a train wreck that occurred November 1, 2009 at the same location. 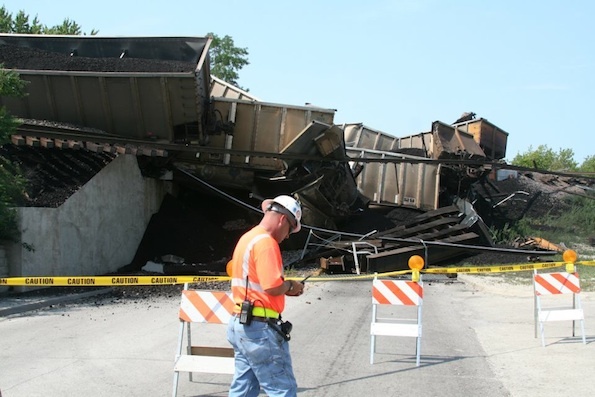 An 18-car freight train derailed — closing Shermer Road for nine days. The bridge viaduct did not collapse, and was reported to be structurally sound, and not a contributing factor to the derailment. The 2009 derailment was caused by a defective wheel assembly (VIDEOS from the 2009 incident Glenview Northbrook Train Derailment North Division and Glenview Northbrook Train Derailment South Division). Bridge work for the railroad over Shermer Road last year, which was originally planned to start on June 6, 2011 and last 60 days, started in late June 2011 and ended early October 2011. The repair involved installing new braces and repainting the viaduct, but not major structural repairs. A fire possibly caused by downed power lines and fueled by dry brush on the north side of the ex-bridge was quickly extinguished by Northbrook firefighters. An extra alarm MABAS Division 3 Box Alarm was called, but the alarm was quickly struck out. Firefighters from Glenview, Mount Prospect, Wheeling and other communities assisted Northbrook Fire Department. Glenview residents in Princeton Village, a gated community just northwest of the crash, reported that they heard a particularly loud rumble. The rumble was much louder than the usual rumble of a fast-passing train. Spilled coal on the north side of the Shermer Road railroad bridge. See over 160 more photos.